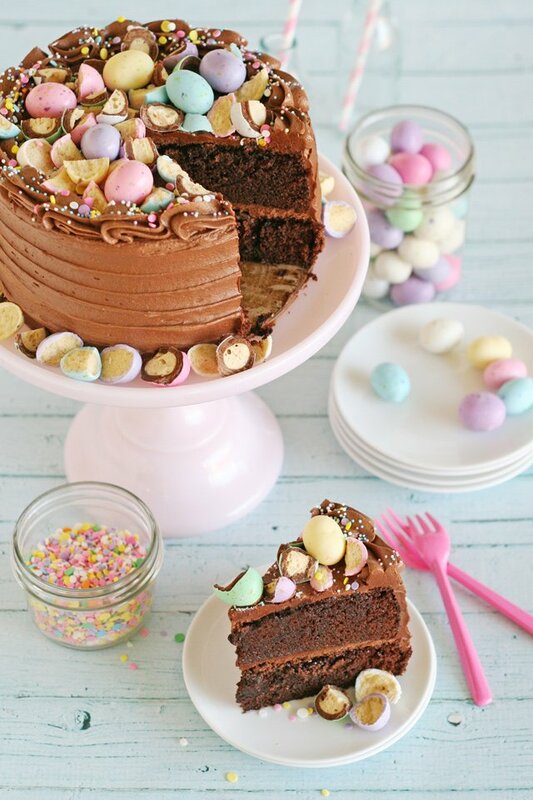 Let’s celebrate spring with this pretty pastel Chocolate Malt Cake! 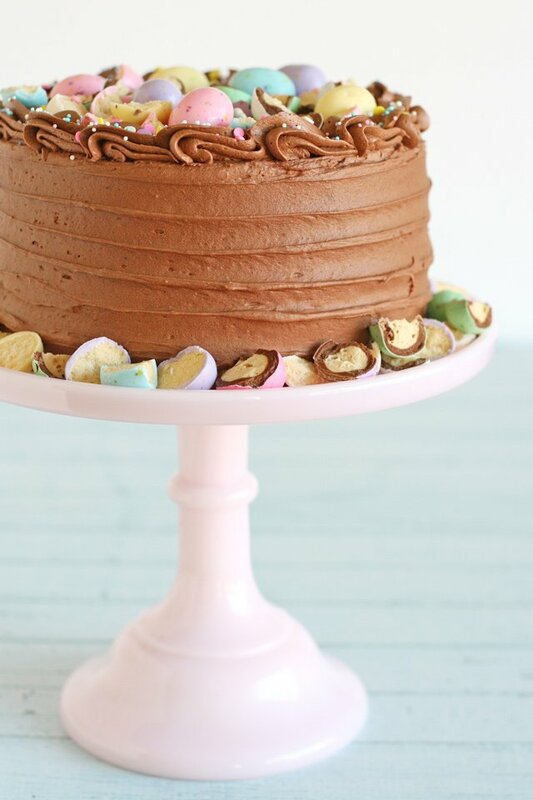 This cake starts with my favorite chocolate cake recipe, then is topped with delicious chocolate malt frosting and pretty spring malt ball candies! I think this cake would sure be a beautiful addition to an Easter meal or even a spring birthday or baby shower! The malt flavor in this recipe is subtle, but it’s just enough to make this cake a bit different and special. I enjoyed one nice slice (and served my family the same) and then had to give away the rest to a few neighbors so I didn’t eat it all myself! 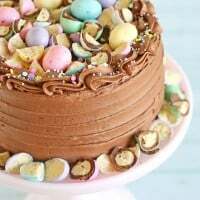 I love the pretty pastel colors (of these spring malt eggs) against the rich chocolate, but this Chocolate Malt Cake could be enjoyed any time of year by using traditional (brown) chocolate malt balls (such as Whoppers). Prepare cake pans by rubbing the sides of the pans with a little oil or butter and dusting with flour. Line bottoms of pans with parchment paper. In a large mixing bowl (the bowl of an electric mixer), stir together sugar, flour, cocoa, baking powder, baking soda and salt. Stir in hot water or coffee (the batter will be thin, don’t worry, this is right). 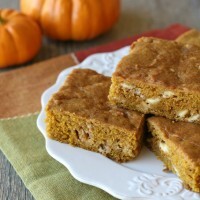 Bake until the top of the cake is smooth and has a slight dome and a toothpick inserted in the center comes out clean. I baked the cake shown in two 7" pans and baked them 35-40 minutes. You will need to adjust the bake time based on the pans you choose. In a small bowl add malt powder and heavy cream and stir well. This will make a thick paste. Set aside. Add cocoa powder and blend until well incorporated. Add 1 cup of powdered sugar and continue to blend. Add the malt powder/cream mixture and blend well. Add and additional 2 1/2 to 3 cups powdered sugar (while slowly mixing) until you've reached a nice thick consistency. The frosting should be thick, smooth and fluffy. Frost fully cooled caked as desired (notes below for cake pictured). Top with chopped or whole malt ball candies, if desired. Notes- Look for malted milk powder near powdered chocolate milk mix. Adding coffee in the cake portion will not add coffee flavor to the finished cake, it simply enhances the chocolate flavor. The cake pictured was baked in two 7" cake pans. I like to use 7" pans to produce a slightly taller cake. This recipe would work perfectly well with either 6", 7" or 8" cake pans, but the finished cake height will vary according to the pan size. Feel free to bake this cake in a 9"x 13" pan for a simple, single layer sheet cake. The cake is fully baked when the top is smooth and has a slight dome, and a toothpick inserted in the center comes out clean. 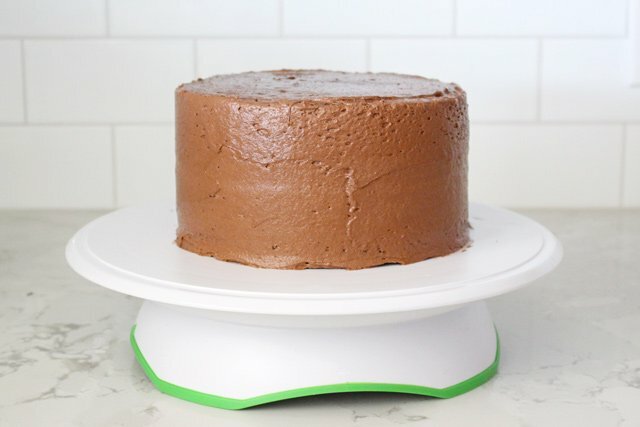 Once the cake is baked and fully cooled, use a large serrated knife to level the layers (as needed), add a small dab of frosting to a cake turntable, then place a cake board (the same size as your cake) and add another small dab of frosting (on top of the cake board). Add one layer of cake, a generous layer of frosting, and then your top cake layer. Using a small offset spatula, spread a thin layer of frosting around the cake to create a “crumb coat”, or a layer of frosting that seals in the crumbs. This layer of frosting should be relatively smooth, but does not need to be anywhere near perfect, it’s simply a base layer. 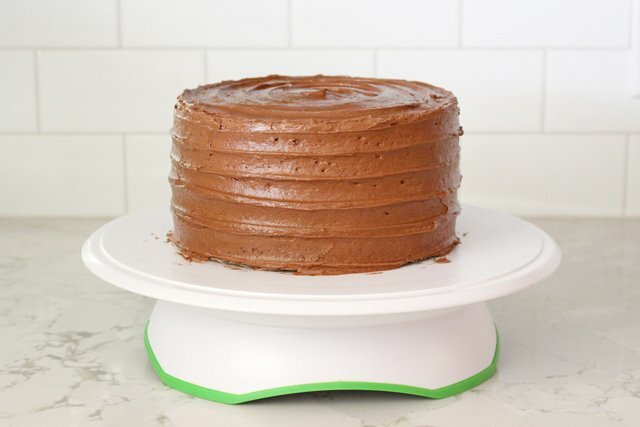 Once you have your first thin layer of frosting (the crumb coat), place the entire cake (and the turntable) in the freezer (or fridge) for about 30 minutes. This will allow the frosting (and cake) to firm up and make the final frosting layer much easier (and neater). Once the first layer of frosting (the crumb coat) has chilled and the cake and frosting are firm, add another layer of frosting all the way around the cake, a bit thicker this time. After smoothing the icing a bit you can add some texture by holding the offset spatula horizontally and dragging the end of the (rounded) blade through the icing (while turning the turntable). Work your way up the cake, then use the same motion to create a spiral in the icing on the top of the cake. For the cake pictured, I reserved a bit of frosting and after creating the horizontal lines (and swirl pattern on top), I put about a cup of frosting in a large piping bag fitted with a closed star tip (such as a Wilton 2D) and created a little shell boarder around the top edge of the cake. I finished the cake with whole and chopped malt ball candies (or I guess they’re more malt eggs). I used Brach’s Malted Milk Eggs (I found at Target) and I also used some candies labeled “Mighty Malts” from Dollar Tree. The Brach’s ones were a bit tastier (they are the ones pictured with chocolate on the inside as well as the malt), but the Dollar Tree ones were such pretty colors I wanted to use them too. I added some mixed pastel sprinkles for the final touch. Note – This post contains affiliate links as I share my favorite products for your convenience. What a pretty cake, Glory! YUM! This looks amaaaazing! I love chocolate cake and you! That is definitely a fun cake to welcome spring in! Btw, nice kitchen update and welcome back. What a beautiful and yummy looking chocolate cake! This is so very fun and pretty!! Just wondering if you have any tips to actually make the cake a Malt cake as well? Would I need to substitute anything in the ingredients list or could I just add the malt flavour as well? I actually did a test run with adding the malt powder to the cake as well, but found that even when I added a pretty generous amount (3/4 cup powder) I couldn’t taste the malt flavor over the chocolate flavor. I made this adjustment to the recipe above and left everything else the same. The cake baked up just fine and was delicious, but just tasted like a chocolate cake. Feel free to experiment and let me know what you discover. I think if you want the malt flavor in the cake as well you may need to reduce the cocoa powder by a bit so the chocolate flavor is not so rich, and the malt can shine. What is your suggestion for a substitution for malt milk powder? I’m not sure if malt flavoring comes in any other form (than powder). This cake would be equally beautiful and delicious as simply a chocolate cake (without malt flavoring). 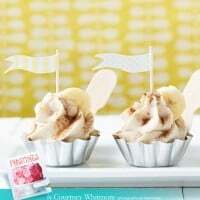 Feel free to omit the malt powder from the frosting recipe above, and then reduce the heavy cream to 1 tablespoon and add it after you’ve added most of the powdered sugar. This cake looks absolutely amazing!! I’m actually going to make it for Easter Sunday. I was wondering though, how early in advance could I bake and store the cakes? Should I only make them the das of? Feel free to bake the cake a day ahead of time, and then I would frost it the day you plan to serve it. Once the cake layers have cooled, wrap well in plastic wrap, then wrap in foil and place them in the freezer. This will keep them fresh and moist, and also make it easier to level and assemble the layers, since the cake will be a bit firm (when freshly removed from the freezer). I am in the process of making this cake, and on step four it says to add vanilla. Vanilla isn’t a listed ingredient for the cake. Am I just missing something? Opps, no, it’s my error! There should be 2 teaspoons of vanilla. 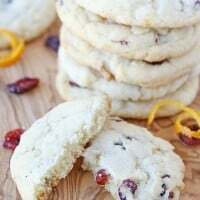 I just edited the recipe now! To be fair, I’m sure it would be delicious with or without the vanilla, so I hope you were able to move forward. Thank you, I guessed and did 1. I tasted some crumbs, and I can not wait to cut into it today. It is delicious. Thank you for our new Easter Tradition. Hi! I noticed that the cake recipe is the same one as your perfect chocolate cupcakes one but there’s 3/4 cup of milk and hot water, instead of 1 cup. Is there a reason for the slightly lesser amount of liquids? 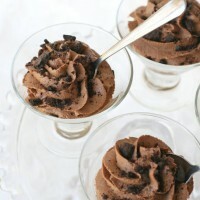 Btw, I LOVE your perfect chocolate cupcakes recipe and normally use it for a cake! Hi! So glad you’ve been enjoying my recipes! Yes, I reduced the liquids a bit because I added an extra egg (3 eggs instead of 2 as listed in the original recipe). Over time I’ve made this recipe many times and to be fair it works perfectly well both ways (2 or 3 eggs), but the extra egg, combined with slightly less liquid seems to produce a bit more sturdy cake (while still nice and fluffy, and with the same great flavor). Happy baking! What a gorgeous cake! I love all of the eggs on top! Thanks so much for the lovely comment! So glad you enjoyed it! What do you consider best quality unsweetened cocoa powder? I would like to know also. What is considered best quality unsweetened cocoa powder? When I look for it…it always list dutch processed. Wow! 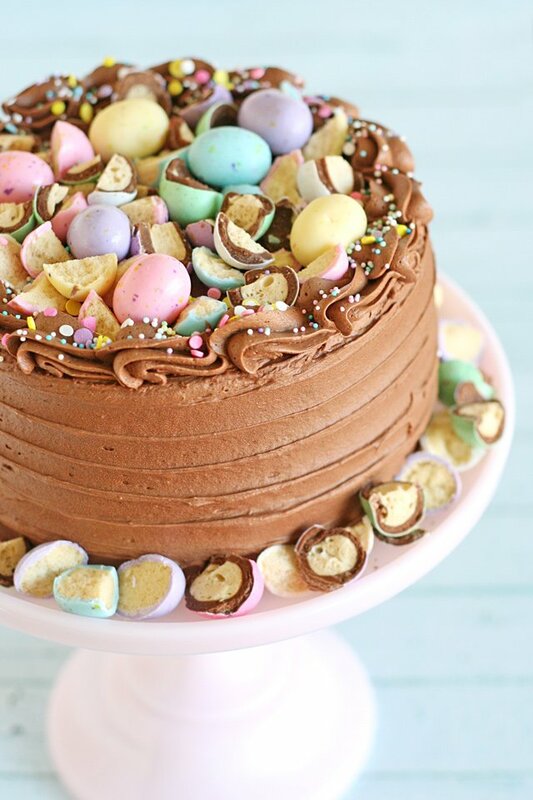 I made this cake for Easter and it was a HUGE hit! We enjoyed it again this evening and it was just as moist and delicious as yesterday! Thank you!!! I have to bake a birthday cake for 30 people and I want to use this recipe. I’m thinking of baking a 3 layers 10″ cake. Would 4 portions of the recipe be enough and would this feed 30 people? It’s my first time baking a large cake so would appreciate any tips you can share. Thanks!! In the event of me not having access to malt powder and if I only have chocolate malt powder, would you suggest using it. If so how much? 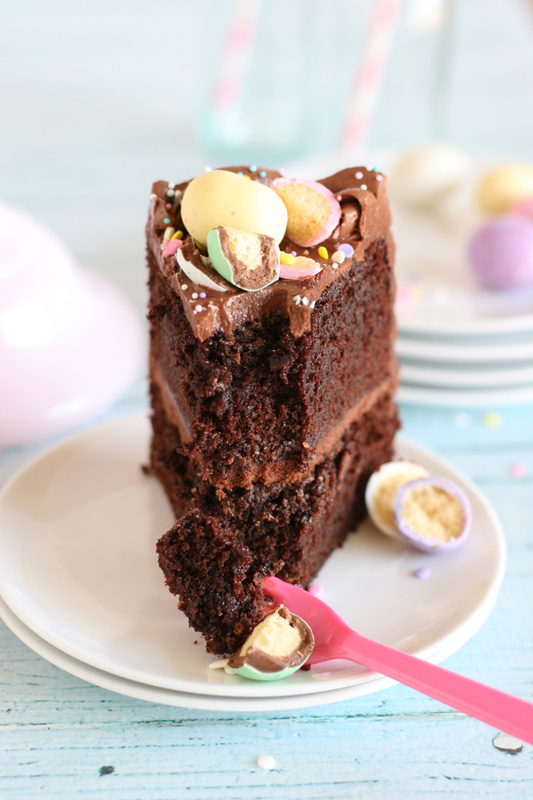 This is my go to Chocolate Cake recipe every time now, it never fails and tastes amazing. Thanks you for an amazing recipe! If I have 9” cake pans, what would the bake time be? Can you use 3 -8″ pans? Ahh!! thank you SO much for the notes on how to decorate. No one ever does that! I found the picture of your cake on pinterest and just knew i had to make it for our family easter! However, im new at cake decorating and had no idea how to create the boarder. THANK YOU!! My family is gonna LOVE this! !